Capitale interior features tall Corinthian columns, a beautifully decorated coved ceiling, and an art glass skylight making the Capitale's ballroom one of the New York's great function spaces. Capitale features three private rooms: two on the upper level, each 2000 square feet and seating over 70 and one executive room on the lower level seating 30. Its Grand Ballroom boasts a 16,000 square foot area and its pre-function Grand Foyer is 5,000 square feet of space. 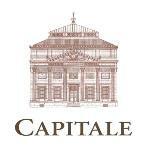 Capitale can accommodate 750 guests for a seated dinner or 1,200 guests for a strolling reception. Capitale features two private rooms on the upper level, totaling 2,000 square feet of space.